Ricinocarpos are found in all states of Australia and is probably best known for the species Ricinocarpos pinifolius or ‘The Wedding Bush’. This is a long flowering plant with an attractive habit. Use it as a feature at the back of the garden border, ot grow it as a dense informal hedging plant. 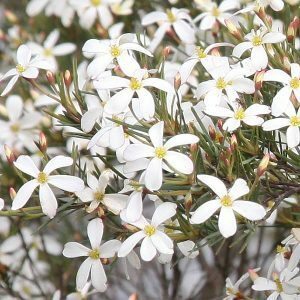 With nice green foliage, and masses of fragrant white flowers from spring to summer the species is regarded as drought tolerant. If you look closely atb the plant when in full flower, you will see that the flowers to differ between the male and female, all have five white petals, it is the centre that differs. 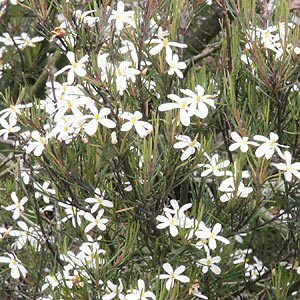 This is a small shrub that will reach around 1.5 – 2m in height, pine needle like foliage and well suited to poor sandy soils which are its natural habitat. Found along the east coast of Australia often growing in coastal sand dune areas and heaths. Full sun and a well drained soil are preferred. The Wedding Bush can be tip pruned after flowering to help maintain a bushy more compact shape. Height – To 3 metres high. Spread – To 2.5 metres. Flowers – Glossy white with a slight fragrance. Flowering period – Spring to early summer and later. R. tuberculatus x R. cyanescens ‘Bridal Star’ will grow to 2m and with sweet smelling flowers is a worthy addition to the garden. R. speciosus or ‘Long Haired Ricinocarpos’ is found in South East Queensland an d North East NSW.